The Municipal Art Society of New York (MAS) supports the designation of the former AT&T Building at 550 Madison Avenue as an individual New York City landmark. Designed by Philip Johnson and completed in 1984, this iconic building arguably launched the Postmodern movement in New York City and is a significant work of American architecture. The lobby at 550 Madison Avenue. Photo: APOPS. At the time of its construction, the monumental former AT&T Building was a daring shift away from contemporary glass towers in the International Style, a term coined by Johnson. 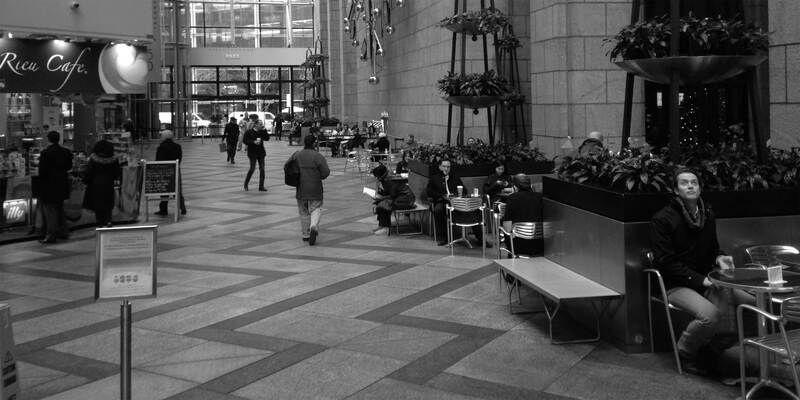 The design for the former AT&T Building instead looked towards the historical, clad in thick Stony Creek granite that remains intact, and reflected in the patterned floor and columns. The same stone was used for Grand Central Terminal, the original Penn Station, and the base of the Statue of Liberty. The building rests heavily on the street atop wide stone pillars and a grand archway entrance. While its ornamental, split-pediment “Chippendale top” is a beloved and prominent feature within the New York City skyline, a change of ownership roughly ten years later shifted the focus towards the base of the building. Despite some alterations, the rear arcade, enclosed above by a half-barrel vaulted glass ceiling supported by white metal lattice and transverse white industrial beams, has retained much of its original integrity. The enclosed pedestrian space comes the closest of any through-block POPS in the city to evoke the nineteenth-century European arcade. Although it is a controversial form, Postmodernism is an important chapter in American architecture and its archetype, the former AT&T Building, contributes to the diversity of building styles in East Midtown. We urge the Landmarks Preservation Commission to designate this exemplary structure in its entirety, from Chippendale top to the ground floor arcade and annex.